The long-awited, much-delayed plain packaging review was published in Australia last week. As Taking Liberties has noted, the most interesting thing about it is that it was slipped out on a Friday with zero fanfare and almost no media coverage. Perhaps the Aussie government is embarrassed by it. It is a slippery report that evades the tough questions and contains only one new piece of research. The impact of plain packaging on the black market is mentioned only briefly and there is a reliance on the same weak behavioural experiments that were used to get the government to experiment with the policy in the first place. There is also a focus on a couple of studies that vaguely suggested an immediate effect on smoking rates, such as the study that claimed a surge in calls to smoking Quitlines when the policy was brought into effect. Sinclair Davidson is not impressed by this model. His blog post about it is worth reading. I would only add one thing. The model purports to show an acceleration in the decline of smoking prevalence after plain packaging came in. 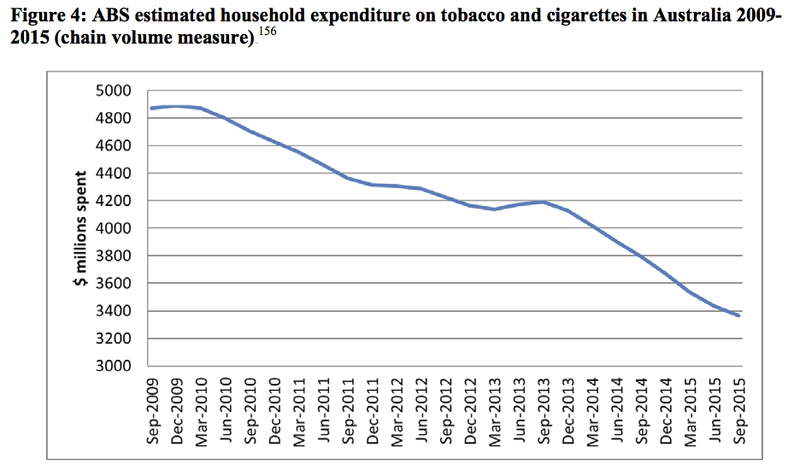 The smoking rate in almost all of the post-implementation period is below the trend line, ie. below what might be expected from the secular trend. 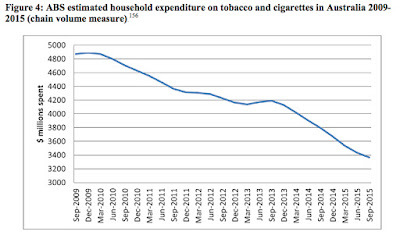 But look again and you will see that the smoking rate in the two years before implementation is also almost always below the trend line. 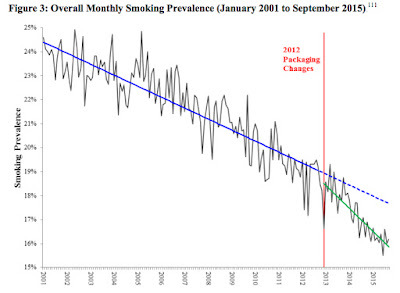 That is because there was little change in the smoking rate in the first few years of this series, leading to a trend line that does not cut through the middle of the data after 2005. If you look at the evidence from the last decade, ie. since 2006, the smoking rate is falling at a consistent rate—and at a steeper rate than the regression line implies. It is only in late 2013/early 2014 that the rate of decline seems to accelerate, albeit only very slightly. The rate of decline in the first year or so of plain packaging is actually no different to that of the previous few years. 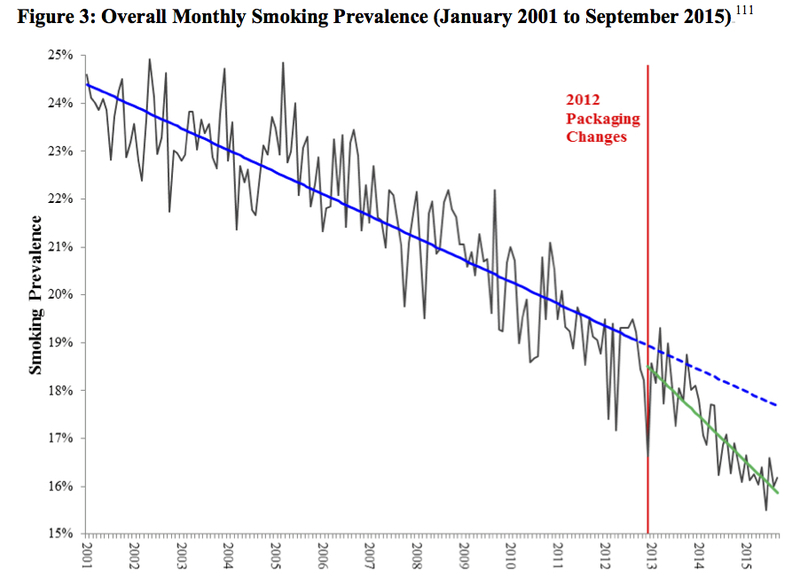 The problem is that the marked decline does not correlate with plain packaging's introduction. 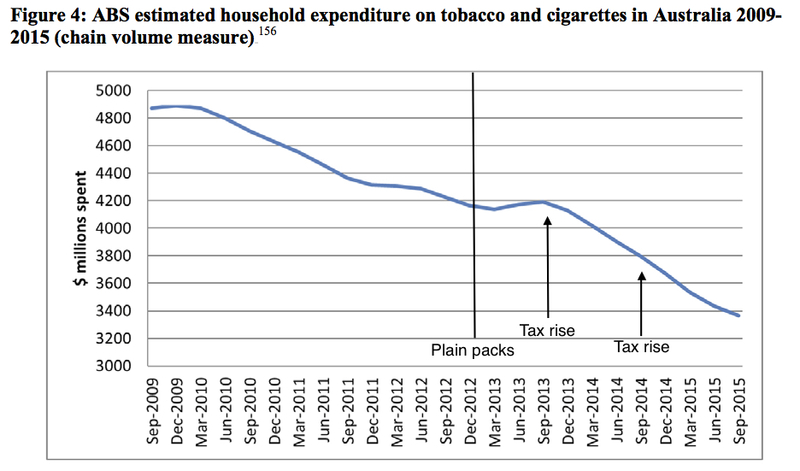 If we flag up some important dates on this graph, it becomes clear that sales rose after plain packaging and only started to fall again when a large tax rise of 12.5 per cent (plus sales tax) was introduced in September 2013. Another tax hike of the same magnitude was introduced a year later. I have been pointing this out for some time. It is nice to have it confirmed in a government report. Or rather, it would have been nice had the government presented the data clearly. As it is, the few people who read the report will probably assume that the decline in (legal) sales correlates with plain packaging. It doesn't. It never did. 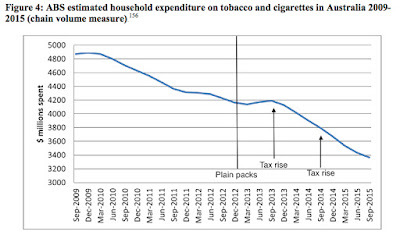 Despite all the fuss and nonsense about people calling Quitlines and telling researchers that they didn't like the new packs, sales of cigarettes rose after plain packaging was introduced and it took some hefty tax rises to bring them down again. Those are the facts. Nothing will ever change them.